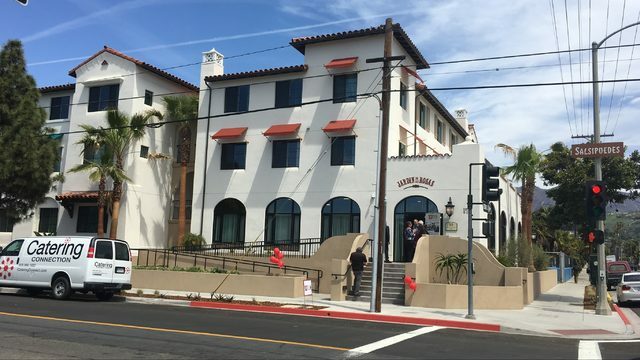 A new Spanish style complex in downtown Santa Barbara will soon be home to dozens of low-income families. The three story development comes in the midst of California's housing crisis and is part of the City of Santa Barbara's Average Unit Density (AUD) development plan to bring more affordable housing to local residents. Wednesday morning's grand opening of Jardin de las Rosas brought out a slew of representatives involved with the project, which was developed by Peoples' Self-Help Housing, along with help from investors. The 40 unit apartment complex, which was 8 years in the making, sits at the corner of Salsipuedes and Haley Streets. The new facility features the Michael Towbes Community Center and the Jeanette Duncan Learning Center. A 35-foot-wide mural created by local artists fills one wall near the interior courtyard and playground. "This marks our 51st site," said John Fowler, Peoples' Self-Help Housing President and CEO. "Each one is special. Real families are going to get housing." Fowler said Peoples' Self-Help Housing is nearly 50 years strong and has housed thousands of families and individuals from Paso Robles to Ventura. Low income housing residents invest sweat equity and help build their own homes. Their monthly rental fees are based on area median income (AMI) and a sliding scale; the Jardin units range from $300 dollars a month up to $1,000 dollars. Fowler said there are currently 30 families working on housing projects through Peoples' Self-Help Housing.